We want you to know that your youth's growth in faith is the priority at CrossFire United. We always take the steps to ensure a safe environment, where youth can connect and grow deeper in their faith. There are many ways you as a parent can get involved. Serving as event staff at youth group events, leading a small group, or a ministry team, going on a retreat, and much more. But most importantly, please pray daily for the youth and for this ministry. Please contact us if you have any questions, or are considering volunteering to help reach the youth of South Jersey for Christ. 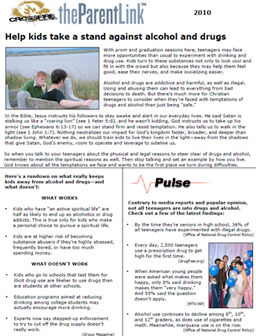 The CrossFire Parent Link Newsletterkeeping parents informed about their Youth. Questions to be asking youth focus’s on prayer for youth, the pulse of youth in today's culture, and more.